Do you need to restore your front door? 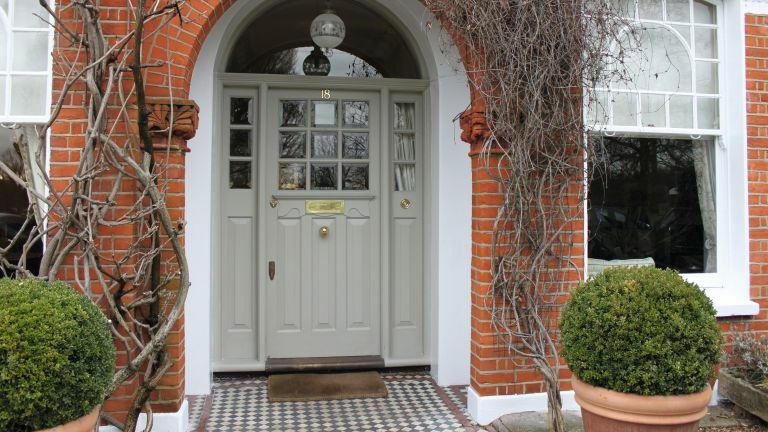 Bear in mind that the front door gives a first impression of your home to visitors, as well as a taste for what's to come on the inside, so keeping it in the best condition possible is important for the overall look of your property. Over time, a natural hardwood front door can, over time, start to look a little shabby and tired. Cracks and flaking paint on the frame don’t do your home exterior any favours, and the letterbox and door knocker might have started to look tarnished. For more decorating and restoration advice, visit our dedicated decorating hub page. Decided your front door is beyond restoration? Our guide to how to choose a new front door is your best bet. Strip any flaking faded paint from the doorstep, ready for a new coat. Rather than use a general-purpose stripper, I like a product formulated to remove a specific finish, such as NB- 510 from Strippers Paint Removers. Remove all loose and flaking paint from the door case. A brass brush can be useful for this job but a steel brush will scratch soft stone. A steel scraper can be used with care – hold at a slight angle to avoid digging into the stone. Fill cracks and gaps with lime mortar (sand and lime putty mixed). Modern masonry paint prevents old stone ‘breathing’. Instead I used ready-prepared limewash, spraying the stone with water before applying. Paint on three to four further coats and allow a day in between for limewash to dry. Wear protective goggles as limewash splashes can damage eyes. Protect the wood by fixing masking tape around the edges of the letter plate. Tarnished metal can be cleaned using Liberon’s Brass & Copper Cleaner rubbed lightly with very fine steel wool. Rinse and dry. Maintain shine with Liberon’s Brass & Copper Polish. Finally, protect with a film of clear wax polish. : Get rid of old wax finishes, dirt and grime from the wood door. Soak a wad of fine steel wool (0000) in Liberon Wax & Polish Remover and gently wash the wood following the grain. Wait a few minutes and wipe away the dirt with a clean cotton cloth. Keep changing the face of the cloth so you take the dirt off. Remove plastic bell push and replace with one suitable for a period house. We found a Georgianstyle brass model at Dartington Steel Design. Electric doorbell systems work off either a mains or battery power source. If yours is run from mains electricity use an electrician to carry out modifications. Apply Liberon Pure Tung Oil with a brush or cloth. Allow the oil to penetrate and wipe off any remaining on the surface after 30 minutes (surplus oil will turn sticky). For oak doors and exposed wood apply four coats allowing 24 hours in between. Rub gently with fine steel wool in between applications. First, ensure surfaces are clean, dry and non-greasy. Place the sealant nozzle against the gap between woodwork and masonry ensuring it touches both sides. Apply by squeezing trigger and running cartridge slowly along the gap. If necessary, while sealant is still wet, smooth finish with a wet spatula. Looking for more front door and exterior restoration advice?